I know I’ve said it before, but I think I should say it again so you know just how true of a statement this is: I am a huge snacker. Mix that with my love of tradition, and I’m completely done for. Mark and I have gotten into quite a rhythm since he has started work. He gets up, I make him breakfast, he leaves, I blog, he gets back, we eat dinner, and then we sit on the couch to watch some Parks & Recreation with a giant bowl of popcorn at hand. You see, I’ve never met someone who can keep up with my deep devotion to popcorn like Mark. He gets it honestly, as he used to work at a movie theater that would send him home with a garbage bag full of the stuff every single night. We can inhale a large bowl of this fluffy crunchy goodness in a little under five minutes, and then run to the kitchen to whip up another batch. I’m a very lucky gal to have found my popcorn-eating equal. While this isn’t our typical “recipe” (aka. a mountain of smoked paprika and salt), I’m thinking that this Chocolate Peanut Butter Popcorn is bound to work itself into our daily ritual. It’s salty, sweet, and just the right about of “sinful.” It’s everything you want in an after-dinner treat, and it’s laughably simple to make. 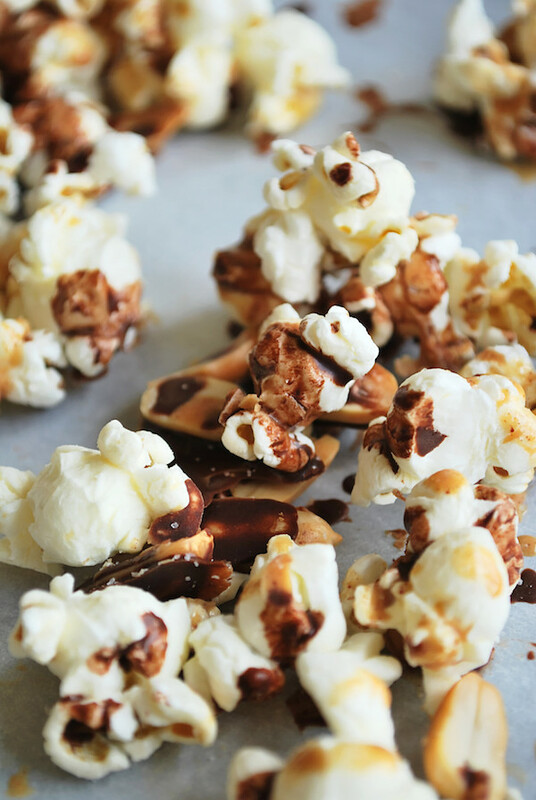 In other words: this Chocolate Peanut Butter Popcorn is the real-freakin’-deal. Start your popcorn party off with some popcorn. Because we are currently air popper-less, we use the store-bought stuff. If you go that route, you want the most flavorless popcorn you can find so that it doesn’t interfere with the liquid gold we’ll be throwing on top. We really like using this brand and this brand because they’re non-GMO and because the ingredient list is and super short: popcorn, oil, and salt! Because I’m a texture fiend, I opted to add some roasted, salted peanuts to this mix. I just broke open some leftover whole peanuts that I got at a Pirates game, then split the nuts into halves. 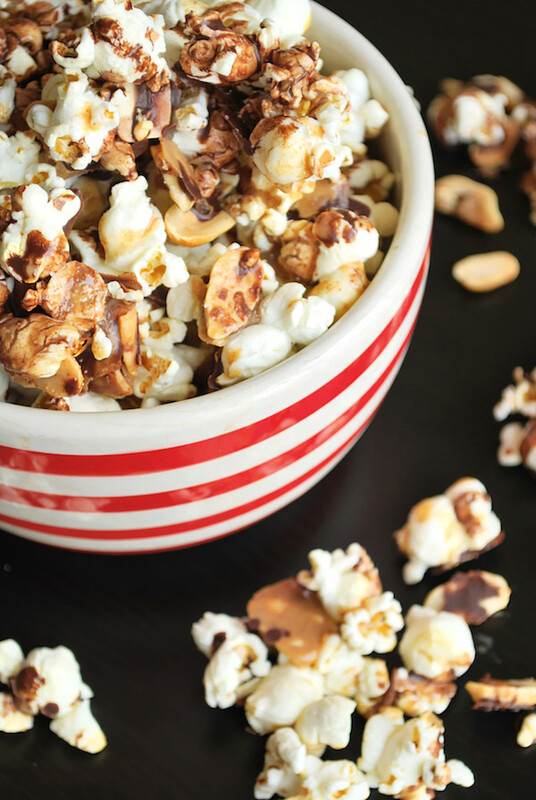 I love the salty, toasty crunch these peanuts give this mix, and the flavor plays really well with the topping! 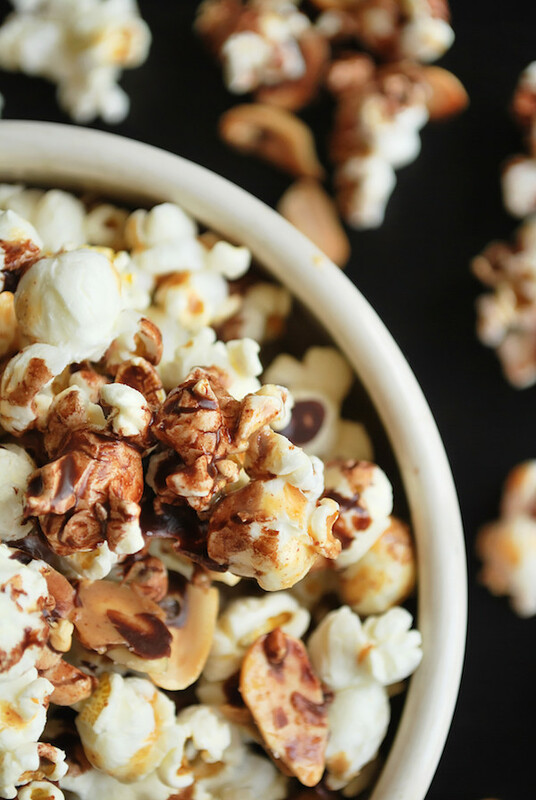 You’ll love sharing this Chocolate Peanut Butter Popcorn with friends, boyfriends, girlfriends, or family. But be warned: the chocolate and peanut butter will melt and get all over your hands…but like, that’s the best problem to have. Drippy chocolate and peanut butter? I could think of worse things. This Chocolate Peanut Butter Popcorn is made with healthy whole foods for guilt-free snacking anytime! Line a baking sheet with parchment paper. Pour popcorn and peanuts in a single layer on top. Add 1 Tbsp. coconut oil to a microwavable bowl/cup. Microwave until melted, about 30 seconds. Add cocoa powder, maple syrup, and vanilla extract. Mix until combined, then set aside. Add peanut butter and remaining 1/2 Tbsp. coconut oil to a microwavable bowl/cup. Microwave until melted. Mix until combined. Using a spoon, drizzle both the chocolate mixture and the peanut butter mixture over the popcorn/peanuts. Sprinkle salt over top. Place in the freezer to set, about 10 minutes. Break apart chunks and enjoy immediately. Affiliate links were used in this blog post. “Affiliate” is just a fancy way of saying that I get some money if you click on and purchase the products that are linked! The money I earn will go directly back into Fooduzzi, so I’d really appreciate you helping me “feed” my blogging efforts!! This could not get any better! First of all, chocolate and peanut butter are involved. Secondly, what a perfect TV (especially Park & Rec) snack! I’m certainly a big snacker as well. Give me a bowl of pretzels or chips and I will go. to. town. so this is probably the better route I should take :) Absolutely love it! Right?! EVERYTHING is better with chocolate and peanut butter! I hope you give this I try – I have a feeling you’ll love it as much as we do! Great blog! Looooove popcorn, so this will be a great addition for movie night.